Think of Rayleigh and two things usually spring to mind; the width of its High Street and the extraordinary number of ‘watering holes’ strung out along its length. There have been fourteen of them over time, including The Weir, TheTravellers Joy and The Drover’s Arms on the outskirts. Six still operate in the High Street today, if you count the most recent, The Roebuck. 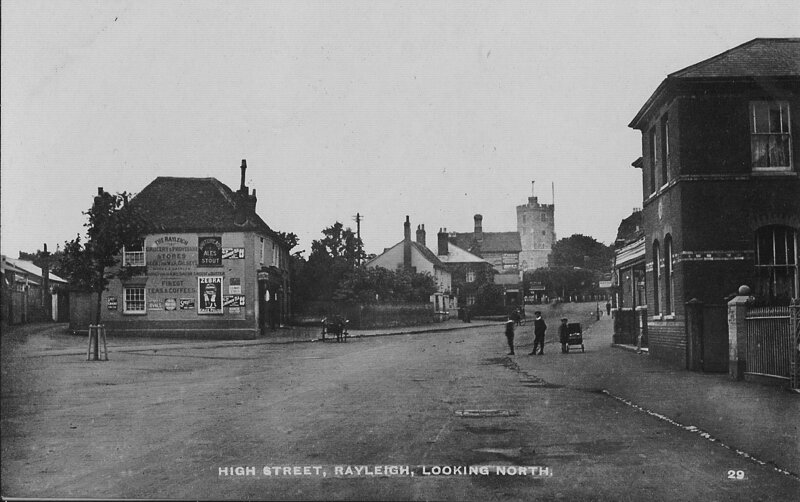 Rayleigh even had its own brewery which traded up until the 1920’s. 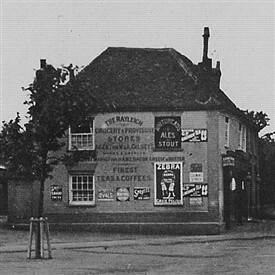 Probably Rayleigh’s most infamous Inn was the Bull, which once stood on the east side of the High Street. Built during the middle years of Elizabeth I’s reign, c.1560, it was renowned for bull baiting, a cruel practice of tethering a bull to a stake to be taunted by dogs, often until mortally wounded. Local feeling turned against the Inn when in 1574 a group of 28 townsmen decided to take the law into their own hands. They succeeded in breaking into the Bull late one night, but were caught. Ringleaders William Hurall, a blacksmith, Henry Livinge, a brewer and John Harryson were charged with ‘unlawful assembly and breaking into the Bull Inn of Thomas Locyn and assaulting those within in their beds and maltreating to the despair of their lives’. As punishment they were pressed into the service of their country – both the Army and Navy of the time desperately needing new blood. Some 230 years after opening, The Bull ceased trading in 1791. The building remained, however, sold in 1828 for £750 to a prosperous horse dealer, who subsequently dug up the bull baiting post and ring. A private dwelling was erected on the site, known today as Kingsleigh House. The Golden Lion no longer stands, but it too, built c.1560, was a famous inn. Known also as the ‘red’ lion or sometimes just ‘the Lyon’ it was the favourite haunt of Rayleigh clergy, who would quench their thirst there after a lengthy sermon. Three stories high, it hosted vestry meetings when the church was in repair, was the seat of local Manor and Assize courts and annually housed the occasion of church officer’s dinners. Along with the Half Moon (once called the Greyhound) and The Old White Horse, it benefited greatly from its location. Near the top of the High Street it was well placed to serve any one of the many travellers who had just walked or encouraged their hardworking horses up London Hill. This steep road was at one time the main route into Rayleigh from London, hence its name. The Crown, while today seeming to dominate the west side of the High Street, did not reach importance until the railway came to Rayleigh in 1889. Dating from the 1700’s, it is timber framed and served the gentry and local wealthy families as a ‘Stout and Spirit House’ as well as being a major staging post for coaches to and from London. The new railway elevated the Crown into the leading hotel in the town when the narrow lane alongside it, then Crown Lane, was widened. Passengers from the new station needed a more direct, and less tortuous route up to the town and for a time the new road was called Station Road, while the Crown became known as the Crown and Railway. Almost cheek by jowl with the Crown was the Chequers, named not after the board game, but after an ancient species of woodland tree. The forge at its rear benefited regularly from its neighbour’s daily coach traffic. The Spread Eagle started trading in the 19th century, though the property itself dates from 1500. One of its many licencees was the aptly named Mr. Boosey, who traded from 1912 until 1937. On the corner of Castle Lane – once known as Meeting House Lane – stands what has been known in living memory as the Elephant and Castle. One of its proprietors went by the wonderful name of Israel Fidgeon. When it closed in 1923, its license was transferred to The Weir on the new A127. The Paul Pry, unflatteringly known as a spit and sawdust establishment, was a favourite with drovers and travellers , for if they could not afford a room they were allowed to sleep in the barn. As in almost all towns and villages, ‘beerhouses’ existed alongside regulated premises, but those that ran them and those that used them often appeared before magistrates. Thomas Carr of Rayleigh was referred to as, ‘a drunken young man’ in 1600 after frequenting such an establishment, while Robert Forbye ‘being a common alehouse keeper’, was accused at a sessions court in 1613 for permitting ‘ill rule and drunkenness in his house’. Several people were found excessively drunk in the ‘common tavern’ of William Tylford in 1629 and in 1660 Mrs. Elizabeth Mears was accused of ‘drawing beer without a license’, alongside Henry Dobson who allowed ‘disorder in his alehouse’ and for selling less than a quart of beer for a penny! The PLOUGH has broke down, but not so the CROWN, and the GOLDEN EAGLES' flew. and the HALF MOON is a shining bright upon the CHEQUERS door.